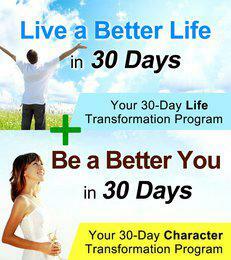 Transform yourself and your life with these in-depth, self-coaching programs! "As an alumni of both 30DLBL and 30BBM, the insights I had and the changes brought about by doing 30BBM have made my 30DLBL experience even better the second time round. " "My boyfriend said to me last night, 'You seem so much happier recently. Do you think it's the Personal Excellence work you've been doing?' I told him it almost certainly is. He told me how I seem so much more balanced, calm, and generally happier. I was so happy to hear that! :D"